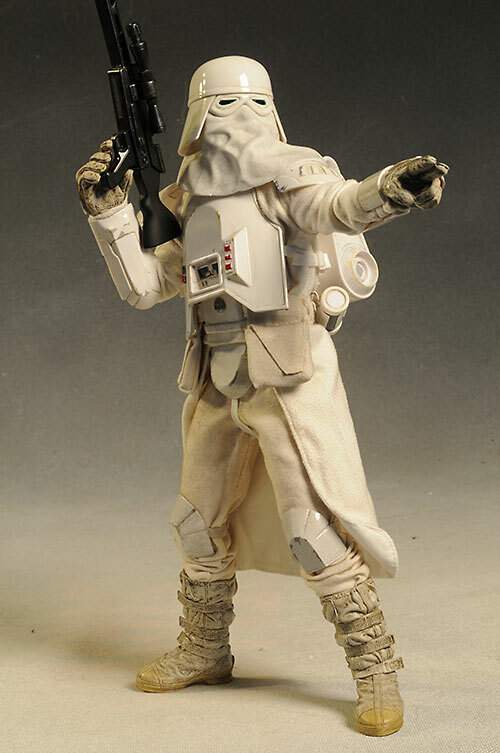 Sideshow has been doing a terrific job cranking out top notch sixth scale figures for the Star Wars license the last couple years. They've focused on aliens and troopers, and fans have gotten some great releases. But one of the most obvious troopers has been left out of the picture - the Snowtrooper. No longer! He's finally been released, both in a regular edition (3500) and an exclusive edition (1500) with an extra accessory. Both have a suggested retail of $150, and while you can find the regular version for a good $15 cheaper with a little effort, I have to say that the vintage blaster that comes with the exclusive is well worth going the more costly route. 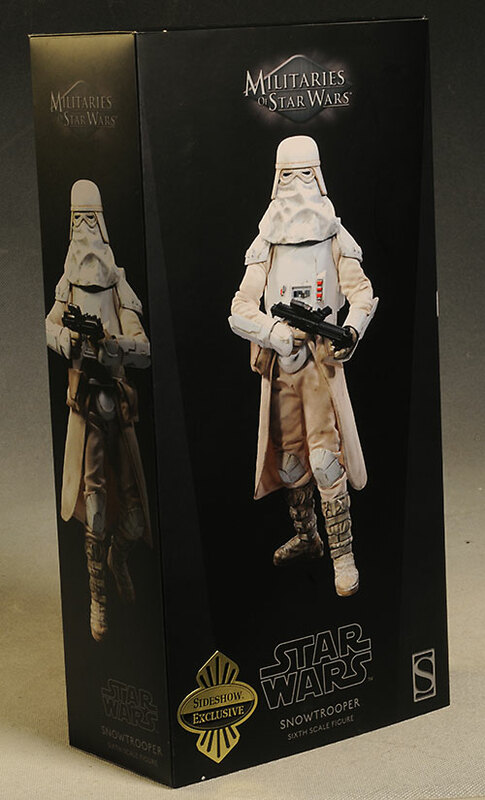 Sideshow has consistently produced great collector friendly boxes for their Star Wars series. and this is another terrific example. It's the usual wrap around top with magnets, and there's no twisties or ties inside the plastic trays. The exterior is a tad boring - that's really Lucas Film's fault, since they dictated this dull look to all their licensors - but I do like the matte black finish over the more glossy boxes. 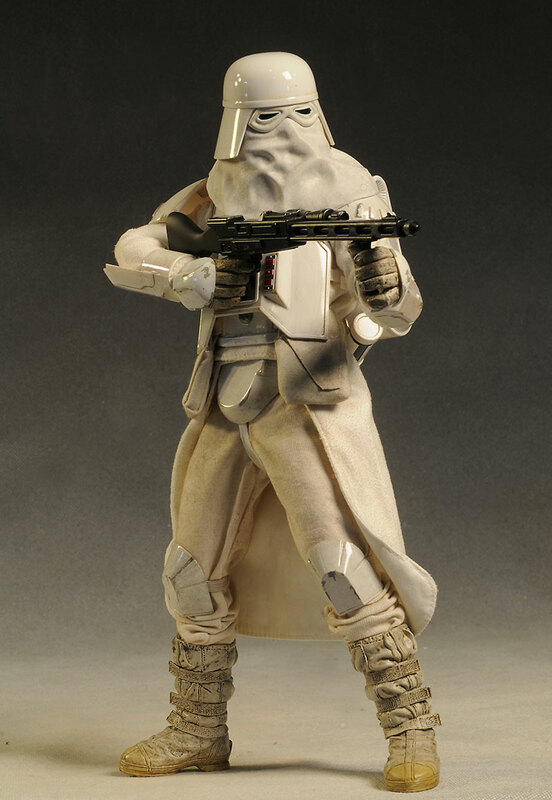 There's no portrait here, but that doesn't mean the sculpting on the helmet and boots isn't critical stuff. 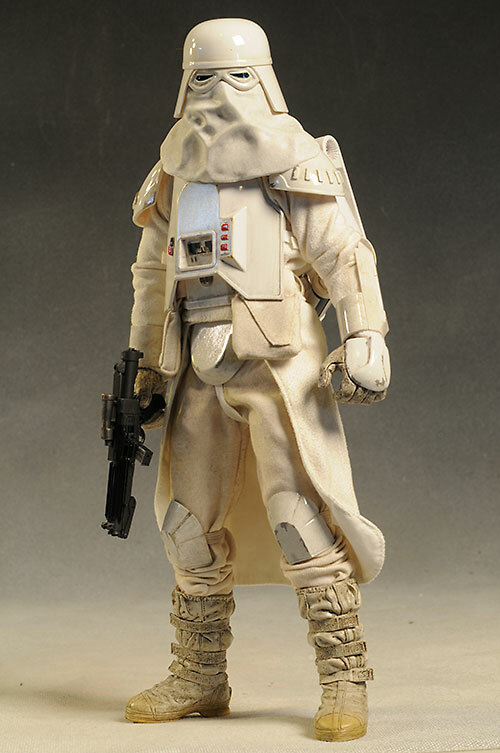 I love the helmet, and the cloth collar is actually stiff, molded to hold the position of wrinkles and folds. It is material, not plastic, but it feels like they dipped it in some sort of plasticizer to give it just enough hold. EDIT - the collar might be some sort of rubber. Not the traditional type that we've seen break down on other figures over time, but appears to be a more stable mix. Suffice to say whatever the material, it's pliable. I also love the boot sculpt, where there's a ton of detail and texture. Sideshow always does great looking boots, but these stand out even among their best. The sculpted armor pieces are great, fitting tightly but not overtly reducing the posability. The hands have sensible sculpts for many poses, and the softer rubber means they swap easily and the accessories slide in and out smoothly. There's not a ton of paint here, but the weathering and damage is extremely well done. The smaller details on the helmet and pack are very clean, and the small doodads on the chest piece look great. But it's really the dirt and damage that make this figure shine, giving it a much more realistic appearance. Even the clothes are dirty, with just the right amount of filth. The underlying Sideshow body has had it's ups and downs, but this is another excellent example of how good it can be when done right. The joints are all very tight, and I had no trouble getting good poses out of the figure. He had no trouble keeping them, and while there's a stand included, you won't require it. I was most impressed with the ball jointed neck. Because the collar of white cloth is fairly soft, the head can tilt and lean with the best of them. This gives any pose more personality and realism. Every hand comes with it's own wrist post too, which is a big plus. I'm hoping other companies, like Hot Toys and Enterbay, start doing this as well. The version here is the exclusive, which means he has an extra accessory. All versions come with the smaller E-11 blaster. The sculpt detail is excellent, and it has the expected folding stock. The exclusive includes a second weapon - the vintage blaster rifle. I really like this one, and think he looks terrific with it in both hands. Speaking of hands, there are 3 different sets. They are designed to work with the accessories, or with certain specific poses. The swap easily, and I like the use of the softer rubber. 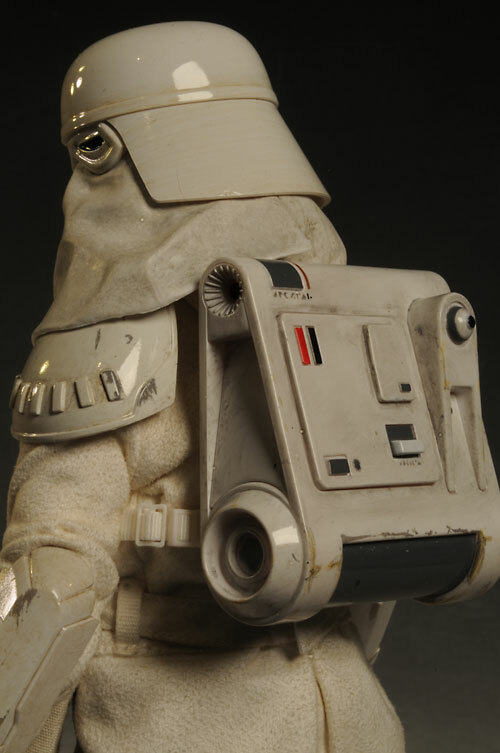 There's also the removable backpack, with some great details and paint work. It attaches well too, something that's not as common as you'd think. Once on, it stays on, and it didn't take 15 minutes to attach. 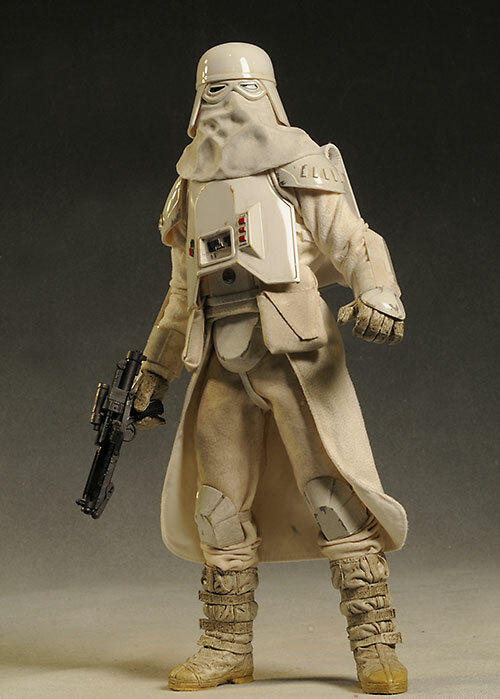 There's a thermal detonator that you can attach to his belt, and to round things out, there's a display base. They started out with the simple Star Wars style black base, but added a snow covering to let it stand out from the pack. The outfit includes the excellent helmet and armor, which I've already covered in quite a bit of detail in the Sculpt and Paint sections. Suffice to say, I'm very happy with the hard plastic pieces of the costume. The underlying cloth body suit looks great, fits tightly, and has just the right amount of weathering and dirt. There's a belt of course, and a couple cloth packs that are attached as well. Overall, it's a terrific looking costume. The only thing that holds this costume back from a full four stars is a minor issue with the boots. The way they've been sculpted and formed, they tend to make the figure topple backward. You can get the ankles inside to push forward far enough to hold them in place most of the time, but you'll probably want to use a hot water/cold water treatment to get them to bend a little more forward all the time. EDIT - I upped the score on this category after playing with the boots some more. The are two piece, with the top and foot separate, allowing for plenty of movement as long as you get the ankle ball in the right spot. 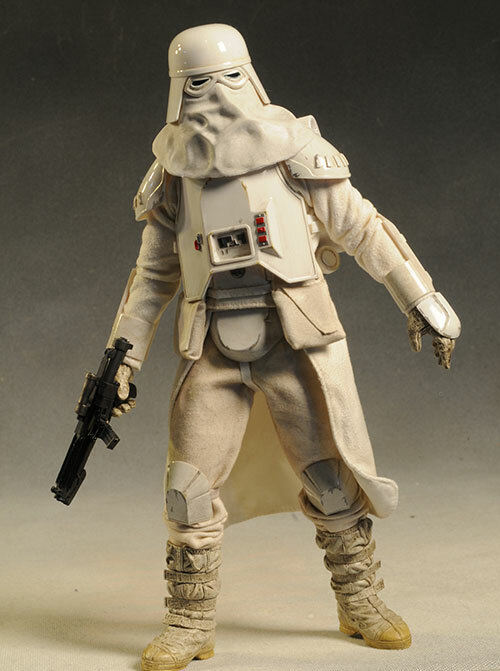 This is a solid figure that could actually take real play. I wouldn't recommend it - every figure a kid plays with ends up broken at some point, and that would be just too painful to take. 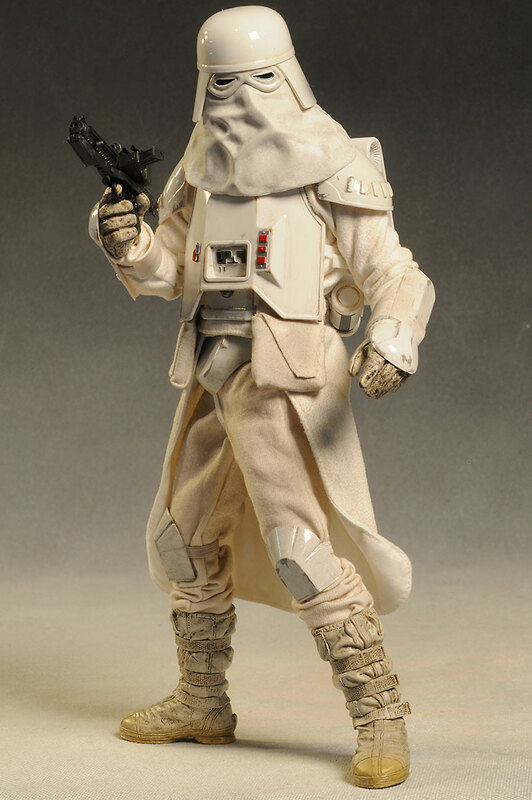 But this is a true action figure, with close ties to his cousin the original G.I. Joe. This is definitely a high end figure, but you should be able to pick him up for less than $140 from some of my sponsors. That's a reasonable price point, considering the quality...and the astronomical prices we're seeing on some other sixth scale lines. That being said, I think the vintage blaster is worth the extra ten bucks, but you'll have to go through Sideshow to get it. 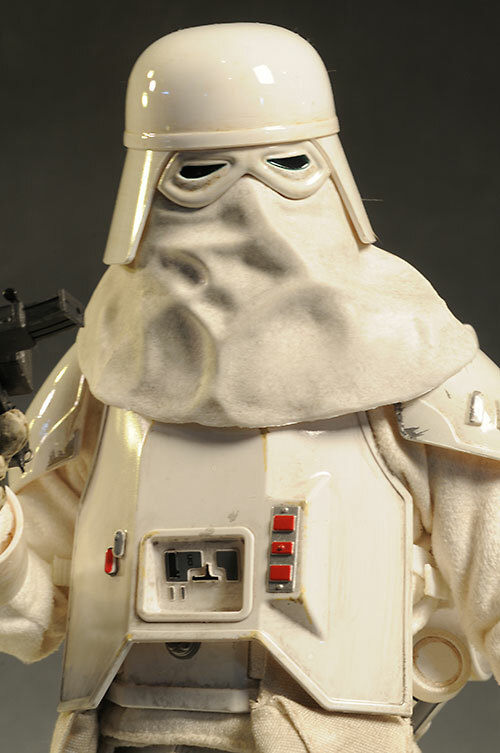 Of all the Troopers, my favorite has always been the Snowtrooper. There's something about the helmet and armor that is just so damn cool - and that's not a pun. Sideshow knocked another one out of the park for me, and their work on the Star Wars sixth scale line over the last year hasn't gotten the attention I think it should. I bet a lot of people are going to want multiples of this guy to surround Vader, causing him to dry up a bit faster than some of the others. Get one (or three) now, or expect to pay higher prices next year. - Sideshow has this exclusive for $150, or the regular for $150. - has him for $150. - is at just $135. - has the figure for $140. - Sideshow just released the outstanding Bossk as well. And IG-88 was just before that. 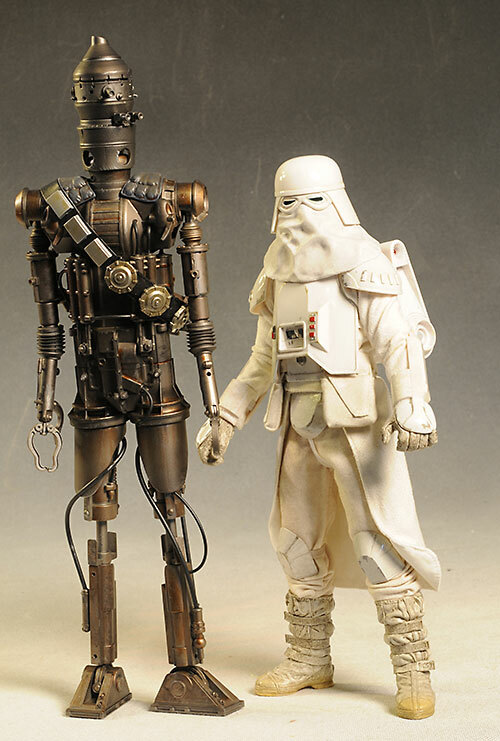 The Battle Droid and STAP is cool as well, along with the double pack of Droids.